l would use 27coupons.com to avail deals from the amazing amazon.in. 30 % off on cameras? That would make my purchase so smooth and inexpensive. Not only the digicam would help me take great photos of people and then boast about my skills on facebook and instagram, it would turn me into a professional (wannabe) photographer. It would also come in handy for my work as I am a dentist and need clinical photographs. Life is easy with such coupons. Who knows? Maybe it will make me take up a hobby like wildlife photography or some other adventurous venture. Life is unpredictable. 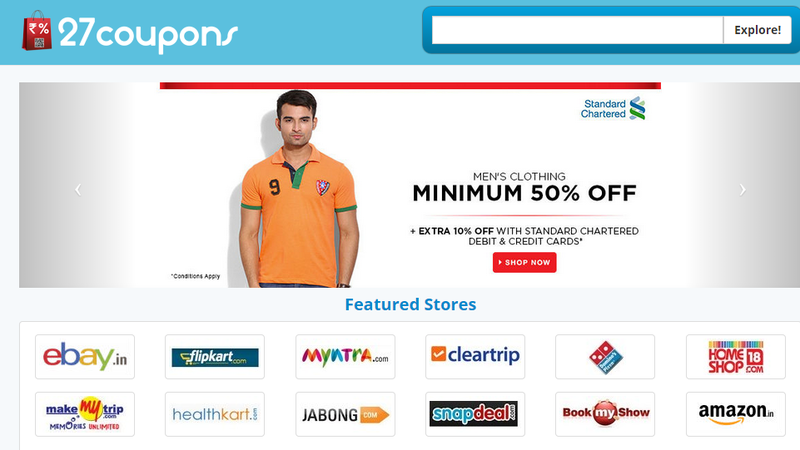 The website 27coupons.com also has a 36% off on RayBans! Now the Dabang within me can rejoice and come out. I would purchase the shades and flaunt them with elan. Thank you so much 27coupons! I am sure it will help me score brownie points with all the hot dames around me. Amazon has an amazing range of mobile handsets and with 27coupons, I can get hold of Nokia, Samsung, Sony, HP handsets with upto 60% off. It is unbelievable and I would love to grab hold of this offer too as my old phone has started to give in and I am in a dire need of a new smartphone. Workouts are a must in the modern day sedentary lifestyle and what better day to kick your day off with some good quality sports shoes? Now 27coupons offers upto 60% on sports shoes on amazon.in and isn't that great? If those weren't enough, this website has coupons for laptops too. Laptops are a basic necessity these days and a 30% off deal on laptops by 27coupons is really a boon for the customers. I would love to grab hold of this deal and upgrade my laptop as soon as possible. Life is getting simpler and better. The site also offers upto 57% off on books on amazon.in. So, awaken the nerdy bookworm within you and get shopping. I would love to avail this offer and purchase all those books I wanted to read but couldn't manage the budget for. This sure is a once in a lifetime opportunity. The hottest deal of them all is the electronics deal on 27coupons. With the help of the 75% off coupons, I can purchase all the basic daily need items that were just lying in my online shopping cart for my lack of will. Now this deal is going to give me the necessary push to finally buy those electronic items like iron, mini-fridge, a new TFT screen for the computer in my office and many more such things. A yet more exciting deal is the 82% off on watches deal on the website. Watches maketh a man a superman. They are things of utility which also help in accessorizing. They are style statements, status symbols and what not! I would love to avail the amazing offer on 27coupons to purchase a flashy new watch for myself.